HTK Architects recently had the opportunity to participate in Canstruction, an annual charity event in the Kansas City Oak Park Mall facilitated by the Harvesters Community Food Network. Our HTK Architects team, along with many other Construction and Design firms from around the region, came together in 2016 to participate in this noteworthy event. The purpose of Canstruction is to inspire local food donations through the creation of larger-than-life sculptures and structures made entirely out of canned and non-perishable food items. Once completed, these structures are displayed as part of an art exhibition and afterwards, all of the canned foods are donated to local hunger relief organizations. 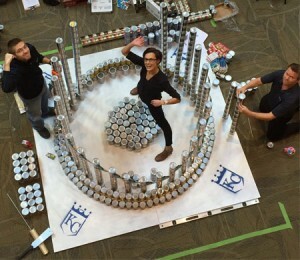 HTK Architects has participated at Canstruction events in both Kansas City and Topeka over the years, enabling our team to cultivate a positive relationship with Harvesters as well as the community. One of the more unique aspects of the event is how it inspires the community to donate canned foods by incentivizing the participating teams to compete with one another. At the completion of each team’s structure, various awards are given, fostering a sense of determination and excitement at the event to create the most extraordinary structure possible. While this spirit of competition amongst the teams drives them to adorn their structures with elaborate detail, including flood lights, LEDs and other extravagant props, it is widely recognized that the ultimate goal is to give back to our community by helping to fight the local hunger. This year our HTK team was excited and able to raise over 1,400 cans of food, which we count as a true win! As part of the competition, each team is given the freedom to design any structure they desire. When our HTK team met this year to brainstorm what our structure should be, there was no question as to what topic was at the forefront of each of our minds. The Royals had just shaken the nation with their incredible conquest, gaining the title of World Series Champions. Everyone agreed unanimously that our team should pay tribute to the Royals’ amazing season and inspire Kansas City by creating a larger-than-life can replica of the coveted Commissioner’s Trophy. This goal was a lofty one, as no one anticipated the true difficulty of stacking cans over 20 cans high for the 30 flag poles needed to imitate the perimeter of the structure. The difficulty of this challenge only fueled our team to work together to discover a creative solution that would allow the structure to stand strong. Through trial-and-error and many mock-ups later, our HTK team came up with a structural solution that would support both the top and the bottom of the structure for maximum rigidity. We worked together to tackle our challenges, which further bonded our team and most importantly, provided the opportunity to give back to local hunger relief organizations. 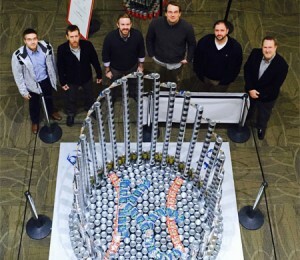 We look forward to the opportunity to continue to participate in Canstruction for years to come.